The time finally came that all Oregon fans dread. Chip Kelly, the mastermind behind Oregon's flash offense left to become the head coach at Philadelphia. Oregon did hire offensive coordinator Mark Helfrich as head coach quickly after Kelly left so it doesn't appear that things should be too different this season. But, is Oregon still a perennial title threat or will the loss of their beloved head coach hurt them this season? The Ducks still have the talent to be a National Title contender with who they have back. Helfrich has his starting quarterback returning in redshirt sophomore Marcus Mariota who proved to be efficient though sometimes mistake prone in his first year as starter. And, the explosive and dangerous De'Anthony Thomas is back. He can score every time he touches the ball and is the perfect playmaker for the Ducks' offense. Thomas will get the bulk of the carries now that senior stud Kenjon Barner graduated. 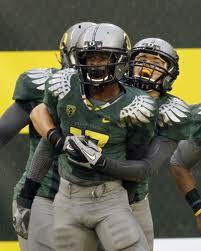 Freshman Thomas Tyner, the top prospect of Oregon's 2013 class will also keep this Ducks' offense running and running. But, if Oregon wants to run many plays in just a minute they need protection for Mariota. This is where the loss of guards Nick Cody and Ryan Clanton may end up costing the Ducks. Although there is still enough speed to score 50 a game and rack up 323 yards per game on the ground last year (3rd in the nation). What happens if teams blitz, or force Mariota to throw, where he has potential, but isn't a proven threat? Junior Colt Lyerla is a very speedy tight end and can stretch the field with his fantastic hands. Although many may be quick to simply point out the talent in the backfield Oregon has just as much talent in their receiving core. Seniors Josh Huff and Daryle Hawkins can both stretch the field with speed and great hands. This will keep teams guessing which is what this fast-paced, electric, up-tempo attack is all about. Chip Kelly's smarts still stay in the form of his disciple Helfrich meaning things shouldn't be drastically different. So don't worry Oregon fans, your team should still be a BCS bowl team. But, even with all his success Kelly never managed to win a championship while in Eugene. Helfrich's goal isn't too win, it is to dominate, and wear teams down with their offense until the big games, hit like the Pac-12 championship and BCS bowl games. 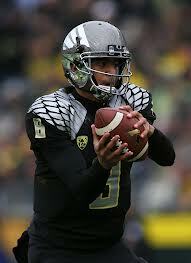 To see a full preview of Oregon's 2013 season, view my College Football Preview 2013-2014 coming out this spring.